On Friday Perry and I drove into the Rocky Mountain National Park. It covers 416 square miles and has 150 lakes, 450 miles of streams, 359 miles of trails, and 60 mountains at least 12,000 feet above sea level. Longs Peak at 14,259 feet has a summit the size of a football field! 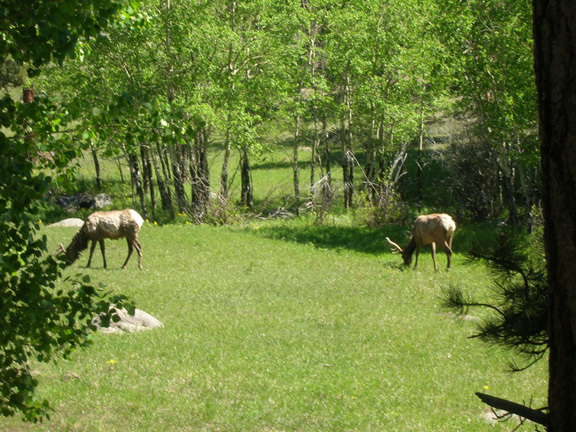 The park is known for its big animals such as elk and big horn sheep. We saw several elk grazing along the road as we drove towards the trail head. Some of the trail was covered with snow. As Sean, Pam, and Perry began walking up this steep slope, they had to be careful with their footing! The sun is more harmful in the mountains because there is less atmosphere for it to pass through. We wore sunscreen, hats, sunglasses, and had long sleeved jackets for warmth and sun protection.